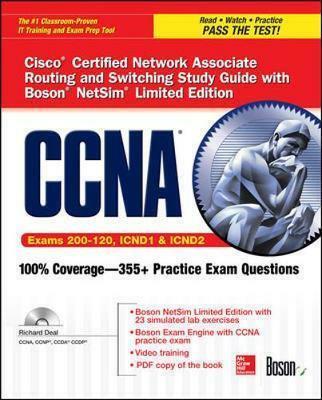 Publisher's Note: Products purchased from Third Party sellers are not guaranteed by the publisher for quality, authenticity, or access to any online entitlements included with the product.The best fully integrated study system availableWith hundreds of practice questions and hands-on exercises, CCNA Cisco Certified Network Associate Routing and Switching Study Guide with Boson NetSim Limited Edition covers what you need to know--and shows you how to prepare--for these challenging exams. Richard A. Deal operates his own company, The Deal Group Inc., recently relocated to Orlando, FL. He has almost 15 years experience in the computing and networking industry including networking, training, systems administration, and programming. In addition to a BS in Mathematics and Literature from Grove City College, Richard has certifications from Cisco: Cisco instructor, Cisco Certified Network Associate (CCNA), Cisco Certified Design Associate (CCDA), Cisco Certified Network Professional (CCNP), and Cisco Certified Design Professional (CCDP). As a Cisco instructor, Richard teaches 9 different Cisco classes.